Brews by the Bay at the Florida Aquarium Giveaway Now! Good morning all! Another beautiful Tampa Bay weather day here, and time to talk about one of my favorite annual events! 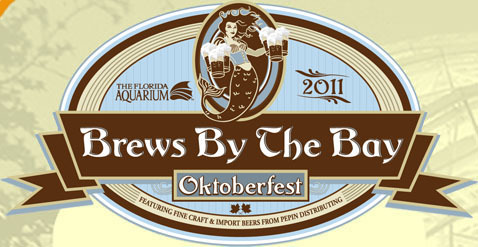 The Florida Aquarium’s Brews By The Bay will feature Oktoberfest brews & craft beers from Pepin Distributing and is the Aquarium’s annual beer & food festival! Purchase tickets and be sure to be on hand to sample more than 85 different types of beer, or simply stuff your face with some excellent food from bay area restaurants and live entertainment! As always, we are awesome and will be giving one of our lucky followers a chance to win a pair of tickets to this much anticipated annual event! All you gotta do is answer some trivia about this amazing event and you will have a chance to win! Just answer the trivia giveaway correctly and you will be entered in for a chance to win from our random drawing! For those of you on Twitter, re-tweeting does increase your chances of winning. For you Facebook fans clicking the share button on our post also increases your chances! Name 2 of the participating restaurants at this years Brews By The Bay event. True or False: VIP access for this event features early entry into the Aquarium starting at 6p.m. True or False: Guitarist Lacy Stidham will be on hand providing entertainment. Well folks, those should keep you busy for a while! Be sure to check back later this evening where we will announce the winner!